Here are some stanzas of a poem I came across when looking for poetry which may inspire young children to write. The simple structure of the stanzas could be used as a model, offering endless possibilities for new poems. in which combinations of the variables were randomly generated. 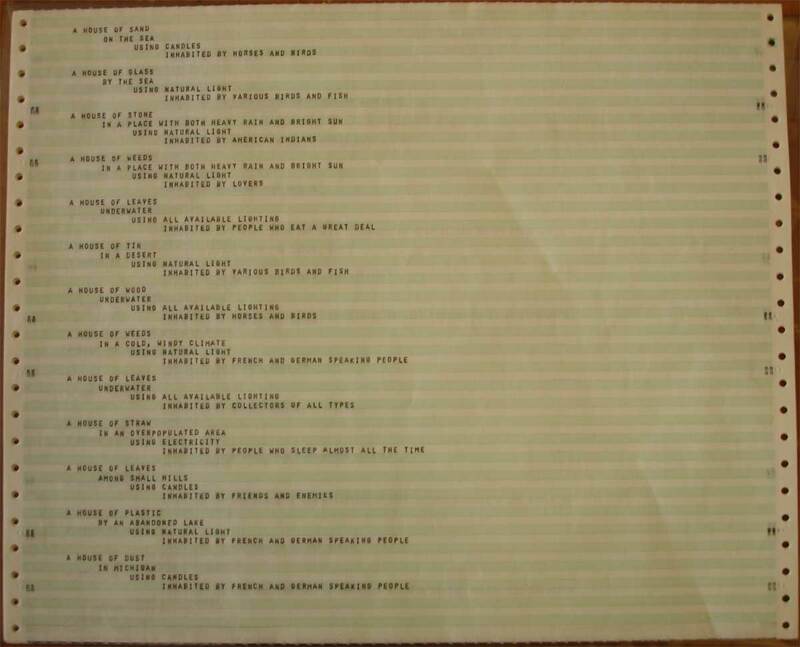 Printed on perforated tractor-feed paper common to dot matrix printers of the time, Knowles printed out numerous pages of these phrases in the form of a long scroll. She then created a book of sorts by tearing off a block of approximately twenty pages at a time, folding it in the manner of an accordion, and placing it in a plastic pouch. Hundreds of variations of houses are possible, as every version of the poem begins and ends with a different set of quatrains. Knowles’s collaboration with the computer highlights the underlying arbitrariness of language, demonstrating how words acquire different meanings through structural relationships and shifting contexts. via: Reinhard Döhl Computertext zur Netzkunst. Vom Bleisatz zum Hypertext. More on it in English here on Calarts, here at Kemper Art Museum and here Room 26 Cabinet of Curiosities. A couple of years ago I found some of this green and white perforated paper with some kind of “computer art” among my dad’s things. It gave me such a weird flashback. All over a sudden, I was transported back to those days when computers and photocopiers were new and people started experimenting with their affordances. Remember the many photocopied hands and faces or other stuff, like … cats? I am digressing. Way back then, the computer paper stood for everything that was ugly, in my eyes. I like the poem and so I am reconciled with the computer paper. Now its retro. This entry was posted on April 27, 2012 at 9:18 pm and is filed under digital, image, letters, literacy, poetry, retro, typography, words. You can follow any responses to this entry through the RSS 2.0 feed. You can leave a response, or trackback from your own site. Also google “Strachey Love Letters” for something from 1952, although a bit more prose-oriented. cool! thank you for finding my post and leaving this information, I will check it out!